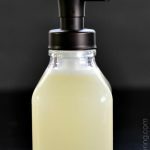 If you’re looking for a unique homemade soap recipe, you’re in the right place! This DIY Creamsicle Stained Glass Soap is beautiful and makes a great natural handmade gift. As a young girl, I fell in love with stained glass. My friend’s mom made her own stained glass, and I thought it was the coolest thing ever! Today, as an adult, I still enjoy looking at stained glass and thinking about the hard work and dedication that went into making something so intricate and beautiful. I figured out a simple way to bring more of that beauty into my life – with DIY stained glass soap! I used cubes, but you can use any shapes you’d prefer such as hearts, circles, stars and more! These Creamsicle Stained Glass Soap Bars make lovely gifts too. People always wonder how you get this effect – it’s really easy! I hope you enjoy! 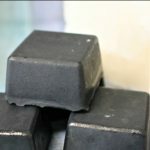 Chop the soap base into cubes and place into a double boiler, heating over medium and stirring frequently until completely melted. Stir in the coconut oil, olive oil and sweet almond oil. Remove the pan from the heat and stir in the vanilla extract and orange essential oil. Spray each cavity of the soap mold with rubbing alcohol to prevent the formation of bubbles. Gently pour your melted soap mixture into your soap mold. Leave about ¼” at the top of the mold to leave enough space for the colored soap cubes. Arrange the colored soap cubes into your soap mixture. Once you’re happy with your work, lightly spray the top of the soap with rubbing alcohol. Allow your stained glass soap bars to harden for at least an hour or until completely cooled. Gently pop out and store in an airtight glass container until you’re ready to use them. What colors did you use in your stained glass soap bars?